The Austral Thrushes (Turdus falcklandii) - also known as Falkland Thrushes or Magellan Thrushes (subspecies) - are medium sized thrushes that occur naturally in South America. They are the most southerly-ranging thrush species. 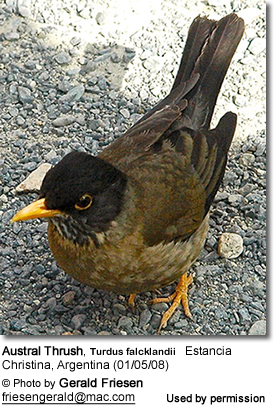 The Austral Thrushes occur naturally in southern South America, in central and southern Chile, southern Argentina, and on the Falkland Islands. One single vagrant has been reported from the South Sandwich Islands in the southern Atlantic Ocean. They occur in various habitats that include Nothofagus forests, open woodland, forest edges, areas with tussac grasses near beaches, agricultural lands and urban backyards and parks. They are common across most of their natural range. ID: The plumage below is more ochre. Range: South and central Chile (including Juan Fernández Islands) east into southern Argentina to the Tierra del Fuego island group off the southernmost tip of the South American mainland. ID: Smaller in size. The upper plumage is olive-brown; the head is darker, the plumage below is paler / more olive-colored. The throat pattern is more distinctive. Range: Birds from Mocha Island (Isla Mocha) located west of the coast of the Chilean Arauco Province. ID: Larger and paler plumaged than ssp. magellanicus. Relatively large in size, this thrush measures 9 - 10.5 inches (23 - 26.5 cm), including the tail; and weighs between 3.4 - 3.10 oz (95 - 113 g). The plumage is brownish; a darker greyish-brown on the back and wings, and a lighter buffy-brown below. The head is blackish. The throat is pale with dark streaks. The wings and tail feathers are slightly darker. The male and female look alike; except the female tends to have a slightly duller and paler plumage, and her head is browner. Immature birds are buffy yellow below with dark brown spots. On the back there is bold pale streaking. Resemble the related Blackbird or Common Blackbird (Turdus merula), but can be identified by the yellow bill and feet, the dark brown head, back and wings; and the paler underparts. These thrushes feed on earthworms, snails and insect larvae and other invertebrate. These ground feeders are commonly seen foraging on open lawns and pastures. They will also find their prey among seaweed cast up on the shore. They also eat various fruits, berries and seeds. Their large, deep cup nests are constructed out of grasses and roots. On the outside these birds use mud or dung for camouflage and potentially to strengthen the structure. The inside is lined with soft grasses, down or hair. These nests are typically placed in a concealed location; in dense foliage or in rock crevices. A clutch consists of two or three eggs, which are incubated for about 14 to 16 days. The young fledge (leave the nest) when they are about 16 to 18 days old,. Breeding pairs may raise up to three or even four broods in a season, if the conditions for raising chicks are optimal.